The mediaeval City of London had many monasteries, but this is the only major one whose church survives, and moreover the greater part of the standing fabric is Norman. The Priory and Hospital of St Bartholomew were founded in the early 12th century by Rahere, a prebendary of St Paul's and a courtier of King Henry I, after he had recovered from a life-threatening illness on a visit to Rome. When the priory was dissolved in 1539, the east part of its church was retained as a parish church, and the nave was demolished to provide space for a churchyard. In the 19th and early 20th centuries much restoration took place here, especially under Sir Aston Webb from 1884 onwards, but also including the rebuilding of the visually important east apse in 1864-6 under William Slater and T. Hayter Lewis. The good internal stonework of the restoration contrasts with the flints that were used externally. Webb was the churchwarden's brother, which explains his involvement in a parish church, when he is otherwise associated with big secular buildings such as Buckingham Palace. The heavy solemnity of the Norman work combines with the darkness of the interior to produce a monumental and antique atmosphere that is unlike that of any other City church. The 15th-century monument to Rahere, the founder, occupies the traditional place of honour on the north side of the sanctuary. The church is reached from West Smithfield through a 13th-century gateway that supports a half-timbered building of 1595. A statue of Rahere fixed to this building was given by Sir Aston Webb in 1917. The gateway once led into the mediaeval south nave aisle. Its date is indicated by the dog-tooth moulding, which is a badge of the 13th-century Early English style. The path through the churchyard leads to Webb's two-storey porch of 1893 and to a 17th-century brick tower, which is plain, apart from battlements and a cupola. Across the churchyard to the right there is the restored east walk of the priory's cloister. The 12th-century entrance to it is seen on the right immediately after entering the church. 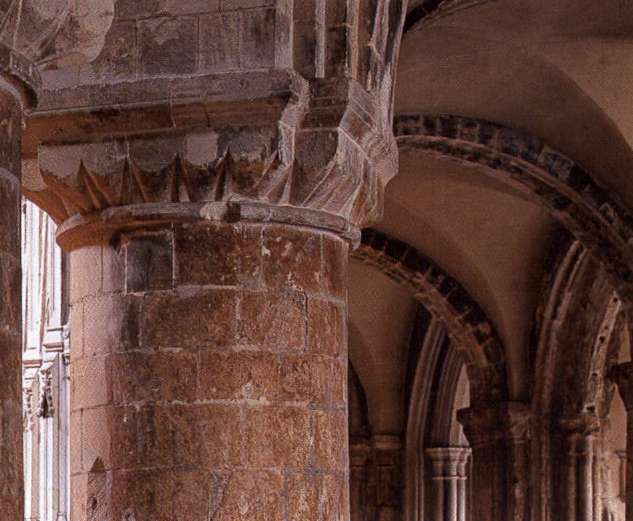 The cloister was recovered for church use in two stages in the early 20th century. 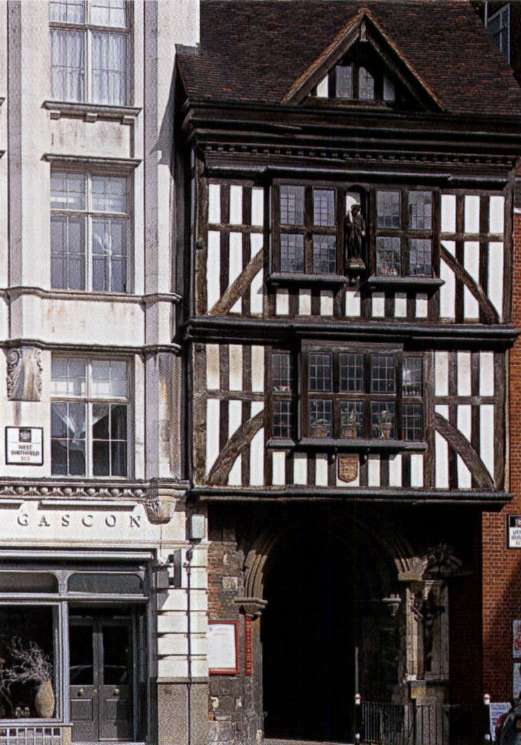 The 13th-century doorway viewed from West Smithfield is surmounted by a half-timbered building of 1595 that bears a statue of Rahere, the Norman founder of St Bartholomew's Priory and Hospital. 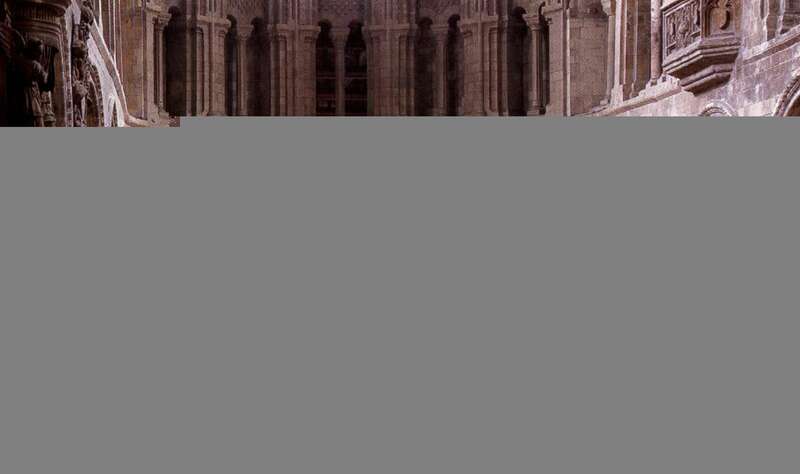 The interior consists of the four-bay mediaeval choir, with an apse, choir aisles that run round the apse to form an ambulatory, a Lady chapel to the east, transepts, and one bay of the nave. The choir is the dominant part. It consists of heavy circular piers with scalloped capitals; arches that are plain except for an outer frame of billet decoration; a gallery of four narrow arched openings per bay under a blind arch; and, finally, a much lighter 14th-century clerestory. The transepts are substantially 19th century (and only half as deep as their predecessors), as is the Lady chapel, which was originally completed in 1336. Notice that the north and south arches of the crossing are pointed, despite retaining their Norman shafts. 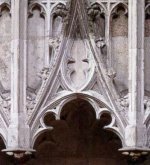 Here we have an early use of the pointed arch in the 12th century, even earlier, it seems, than that at the Temple Church. The only further structural feature of interest is the oriel window on the south side of the choir, which was built at gallery level in about 1517 by Prior William Bolton. It has cusped and transomed lights, and bears its builder's symbol, a crossbow bolt shot through a barrel or tun. The one bay of the nave is preserved because the mediaeval pulpitum, or screen, at the west end of the area used as the canons' choir once separated it from the rest of the nave. Prior William Bolton's oriel window bears his symbol of a crossbow bolt shot through a barrel or tun. The furnishings are largely Victorian and early 20th century. Webb designed the agreeable screen to the Lady chapel in 1897, and was responsible for the pulpit and the lectern. The stalls, the west gallery and the organ case also all date from the late 19th century. The font is an exception, for it dates from about 1405, which appears to make it the only mediaeval font in the City. What St Bartholomew's lacks in old furnishings, it makes up for in monuments, which are earlier than usual and are notably numerous from Tudor and Stuart times. First, however, comes the important mediaeval tomb of Rahere himself. He died in about 1145, but his present monument was erected in the early 15th century, in the traditional place of honour on the north side of the sanctuary. A recumbent effigy lies under a canopy. An angel at his feet holds the priory's arms: two golden leopards with two crowns above. The heavy Norman piers march round the east end of the mediaeval choir. The church's most interesting historical associations are with William Hogarth, who was baptized here in 1697 and Benjamin Franklin, who worked as a printer in the Lady chapel when parts of the church were in secular use. 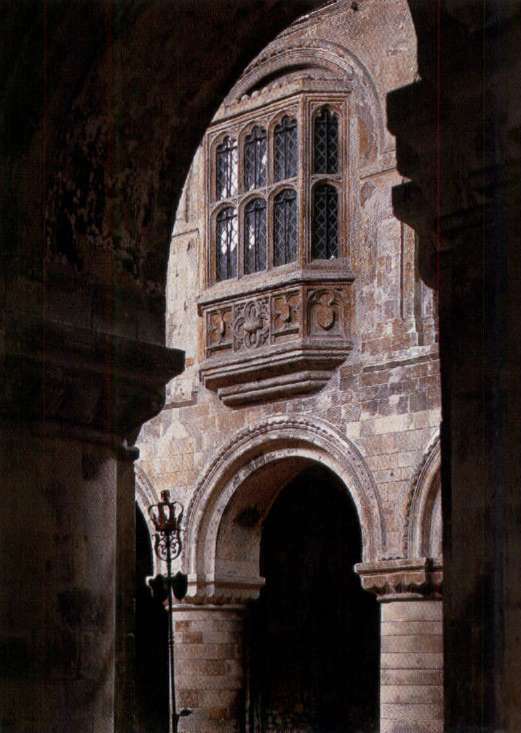 The ambulatory forms a processional way round the mediaeval east end.